What “it” was, exactly, is still a matter of debate. 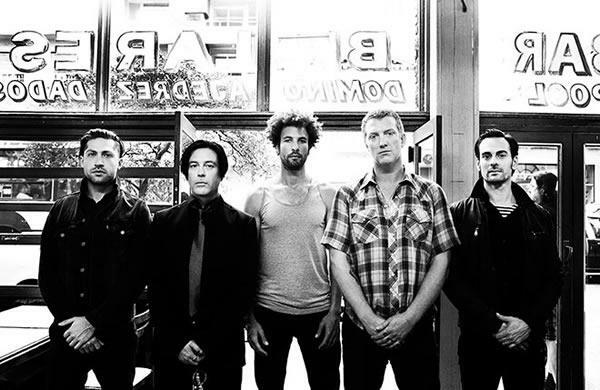 Are Queens of the Stone Age a band? An association? A concept? The intermittent issue of an unhinged Carlo Von Sexron? The toxic byproduct of other bands? A variously shrinking and expanding group of friends and likeminded visitors? Or a secret society? Whatever kind of strange and terrible mutation slouched out of the irradiated California wasteland in 1996, it’s evidently still around. It lives. It breathes. It can’t be stopped. After a lot of “personal ups and downs’, a “manic year”, Homme and the current iteration of the Queens--veteran Troy Van Leeuwen, Michael Shuman and Dean Fertita--along with the outgoing Joey Castillo and returning associate Dave Grohl, would decide to embrace The Beast, “ride shotgun on our emotional bandwagon…hold the horrible, lick the lunacy” and, instead of shying away from uncomfortable or painful subject matter—face it head-on. Along the way, they picked up known associates Mark Lanegan, Nick Oliveri , Jon Theodore (now drumming full-time in the current live incarnation), Sir Elton John, Trent Reznor, Alex Turner and Jake Shears. Whatever happened - out there, in whatever desert arroyo, former meth lab, decommissioned missile silo, nuclear test site, underground laboratory, convergence of brain waves and gamma rays, QOTSA emerges with not only their best work to date, but one of the most ambitious, fully realized rock albums in recent memory.